Ensure that international customers can effectively and efficiently use Primozone’s solutions to process their transactions. Enhance collaboration and ensure version control among the members of Synergex’s writing team. Create a more intuitive web experience for users that makes it easy to navigate and find the information they need. Efficiency: Primozone sends MadCap Flare project files directly to MadTranslations for speedy translation and localization. Cost-Effective Translation: User manuals are translated into six languages and delivered to countries worldwide, saving valuable time and effort for Primozone’s writers. Customer Support: Timely customer support from dedicated project managers allow MadTranslations to quickly solve any critical issues that may arise. Founded in 2000, Primozone has been redefining ozone technology with environmentally-friendly water treatment solutions, used in industrial, municipal, and aquaculture operations worldwide. At the heart of their solutions is their innovative ozone systems and generators, which has the highest ozone concentration and lowest lifecycle cost of any such product on the market. To support the use of their products, Primozone provides product manuals to users all over the globe, who depend on their industrial water treatment solutions. Today, Primozone relies on MadTranslations to translate their manuals into multiple languages and ensure that their users are supplied with the information they need. 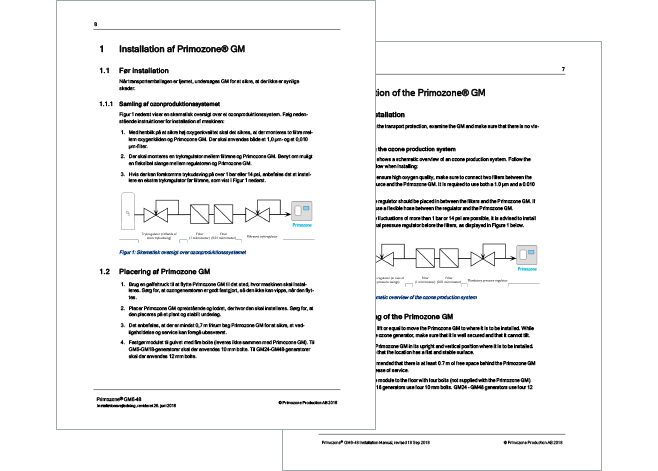 With users based in more than 40 countries worldwide, Primozone makes its product manuals available in multiple languages. Translation quality and expertise in Flare were key factors in the company’s evaluation process. They needed a partner that would understand how to translate technical content authored in a single sourcing environment. “I did research in firms that did translation for Flare projects, and managed to find several firms spread across Europe, USA and Israel. However, most were either outrageously expensive, or lacked the experience we were looking for,” explained Erik Bergman, technical writer at Primozone. Their search for a partner led them to MadTranslations Inc., a subsidiary of MadCap Software. An evaluation with MadTranslations resulted in translation samples that established them as the clear choice. “We had a product specialist evaluate their test translation, and he was happy with the quality of the result,” recalled Bergman. MadTranslations was able to provide translations at a reasonable price, and also have the perk of working closely with MadCap Software, which gave me confidence that they know the ins and outs of a MadCap Flare project. “In short, MadTranslations was able to provide the translation at a reasonable price, and also have the perk of working closely with MadCap Software, which gave me confidence that they know the ins and outs of a Flare project,” Bergman observed. By relying on MadTranslations as a partner in translation and localization, Primozone has seen tangible benefits in their workflow. “I have saved many hours of work just in handling of the Flare project prior to translation. One e-mail and one uploaded folder was all it took for MadTranslations to start work on 30 targets,” Bergman said. I have saved many hours of work just in handling of the Flare project prior to translation. One e-mail and one uploaded folder was all it took for MadTranslations to start work on 30 targets. Ready to Get Started on Your Next Translation Project?